Simmers of Edinburgh is launching an oat snack called Oat Bakes, with packaging design by Edinburgh consultancy Tayburn. 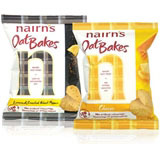 Oat Bakes is an extension of the family of Nairn’s products that includes the Oat Cake and Oat Biscuit ranges. Nairn’s Oat Bakes will initially be available in Holland & Barrett and independent UK health food stores.